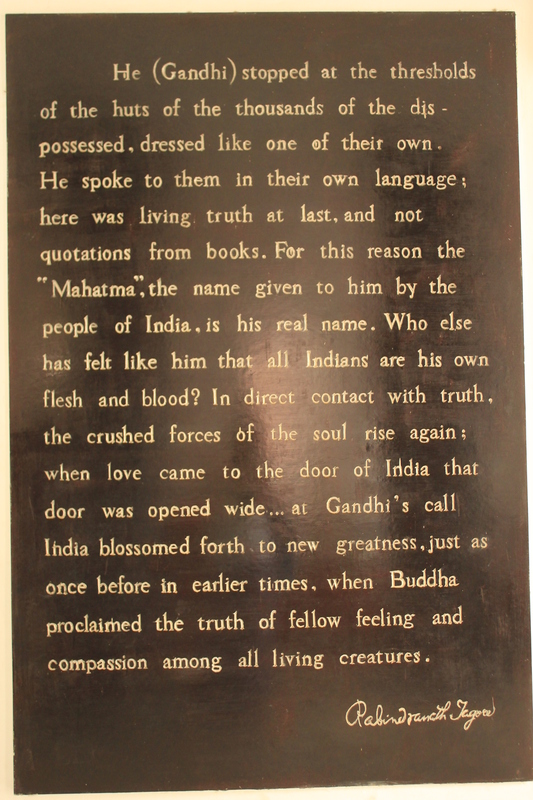 I travelled a total of three months in India; which is not enough to experience this huge country. There is so much to see but I had to concentrate my efforts only on a few places. After spending the first month mostly in Rajasthan and other popular places in the North like Delhi, Varanasi and Agra, I knew that I had to come back to see the South. I would say the South felt a lot different from the North, more relaxed, calmer, and easier to travel (as a solo-female traveler). 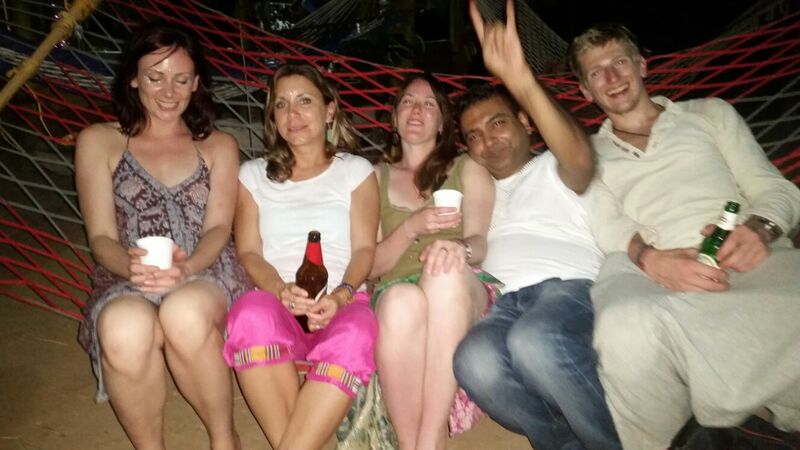 After spending a couple of months in Nepal I returned to India and started my adventures in the state of Kerala. 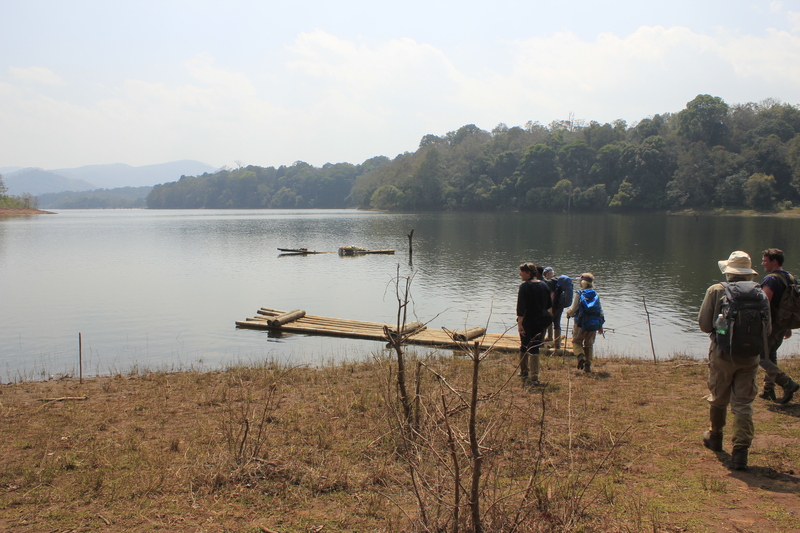 I flew into Trivandrum and went straight from the airport to the Sivananda Ashram in the Neyyar Dam area. I had a small taste of the ashram life in Rishikesh in the North and wanted to get a deeper feel for it in the South. My plan in the South was to not have a plan and just travel to places recommended by other travelers. I knew that I wanted to spend Christmas and New Year’s in a spiritual place so spending a few days at an ashram sounded like the perfect thing to do. This is pretty much the only thing I planned. It felt great to live as part of a spiritual community for a few days. I stayed in a huge all-girls dorm and met an amazing girl Andrea from Mexico; whom I shared a room pod with. We had a simple communal living, all getting up at the same time, going to bed at the same time, eating, and doing all other ashram activities together. We had a pretty strict and busy schedule; which included meditation twice a day with chanting, yoga, karma yoga (or selfless work) and educational lectures and cultural shows. We had an introduction to Ayurveda and Sanskrit writing, very interesting stuff! We also saw a performance of a Katakali dance, a classic Indian dance drama with actors dressed in elaborate costumes wearing tons of make-up and using a lot of hand gestures and eye-movements to tell stories (without words) of war, love and chivalry. For Christmas, we had the opportunity to join a choir that would perform on Christmas Eve; which I joined. Neyyar Dam just across the street from the ashram. We had to request passes to leave the ashram to go see it. Meditation and chanting inside the main room at the ashram. Unfortunately my body was a wreck after all the trekking I did in Nepal carrying my backpack and I had a few injuries when I arrived at the ashram. Lucky for me they had an Ayurvedic clinic on site; where I got some much needed treatments to calm the pain from my sciatica nerve and my bruised inter-coastal muscles. I caused the latter arm-wrestling a kid in Nepal. I took advantage of some amazing and reasonably prized ayurvedic treatments; which miraculously fixed the sciatica nerve pain in only three days. The inter-coastal muscles took a lot longer to heal but improved tremendously after the treatment. Ayurveda is a term in Sanskrit that means the knowledge of life. This traditional medicine system originated in India thousands of years ago and some of the beginnings are found in the Hindu scriptures called the Vedas. Ayurveda seeks to balance any imbalances in the body and aims to keep body, mind and spirit in equilibrium with nature. The imbalances are fixed through adjustments in diet, exercise (mostly yoga), meditation, and with massages. The massages are done with a lot of medicated oils involving different herbs. Ayurveda is based on the belief that all five elements air, fire, water, earth and ether are represented in humans by three “doshas” or energies. These are referred to as Vata, Pitta, and Kapha. When any of these are out of balance, the body becomes imbalanced. The two main practices used in Ayurveda for heeling are Panchakarma and the medicinal herbal massage treatments. Panchakarma can take two to three weeks and it is the cleansing of toxins in the body done in five steps; which include purgation, enemas, detoxification through the nose and the blood. I thought about trying this one but I opted for the more relaxing massaging treatments instead. During my stay in the ashram and through the rest of my stay in the South I tried various ayurvedic massaging treatments to reduce pain, stress and detoxify. These have all worked wonders for me. Here are some images taken from the internet of massages that I got- the Kizhi; which consists of pounding a pouch full of herbs on the areas of pain, the Nasya, an herbal medicine applied through the nostrils to cleanse the sinuses and the upper respiratory tract, the Sirodhara; which is when oil is poured over the forehead during 45 minutes to treat sinusitis, eye diseases and disorders like insomnia. I also tried other full body, head and face massages where the body is completely drenched in warm medicinal oils. And you cannot be shy! they ask you to completely undress and put on a little piece of cloth to cover your privates (just the bottom). I always asked for a woman therapist to feel more comfortable. These are by far the best massages I have had in my life. I highly recommend getting these if you are ever in a India or Nepal where they are very cheap, or trying them in the West but be ready to spend a good chunk of money. At the ashram they had a very special and thoughtful celebration for us for Christmas. They had traditional Indian dance performances, caroling performed by our choir, and a full candle-lit ceremony for everyone to visit the nativity scene while singing silent night in four languages. It was a beautiful and spiritual experience! After we were done with all of the festivities, we were surprised by a visit from Santa who brought us gifts, fireworks and cake. On Christmas day we had a nice xmas brunch and a fun talent show where we saw some impressive performances of signing, playing music and dancing by the ashram guests. typical scene of groups of Indian men walking on the beach and staring at the foreign women. And the best part about the New Year was finding my dad and my stepmom on skype right as they were about to ring in their New Year in Florida. We did a toast together. I took the sleeper class train to Allepey and had a nice time. It was quite and relaxing. See my post on the backwaters of Allepey. 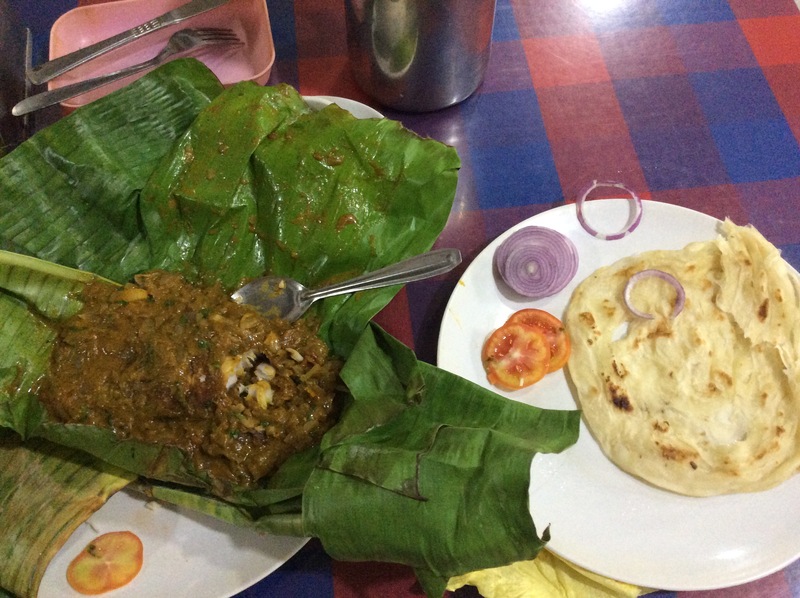 This is a great little town where I definitely recommend trying the local restaurant Thaff for some yummy fish curry cooked in banana leafs. My next stop after Allepey was Kochi or Cochin Fort. This is a very relaxing and friendly port city and also home to the best Homestays of friendly Indian families. You can find yoga and meditation everywhere. The main attraction for many tourists are the Fishing Nets and the wonderful fresh fish that you can buy everywhere. These are operated from the shore. The nets are suspended over the water and counter-weighed by rocks suspended on ropes. Usually the weight of a man walking on the beam is enough to lower them. A team of six men will pull the ropes to get the nets out again. You can buy the fish right there and have a local restaurant cook it for you. 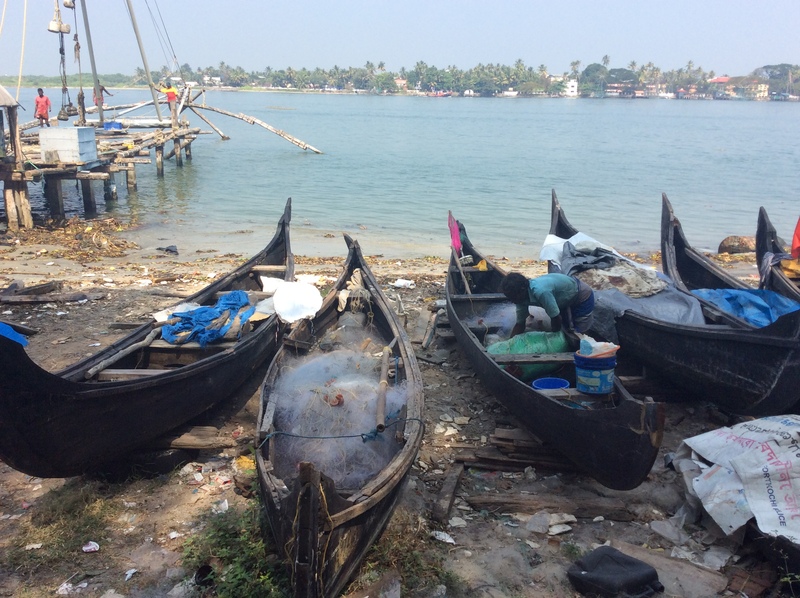 I walked around a bit and took a rickshaw to the city of Mattancherry, just near Kochi. I walked aimlessly and ended up at the gate of an orthodox church at the same time as another man Mathias from Switzerland. We were greeted by the Father who told us all about the beginnings of the Syrian orthodox church in Kerala. kids on the street stopped me to take this photo of them. 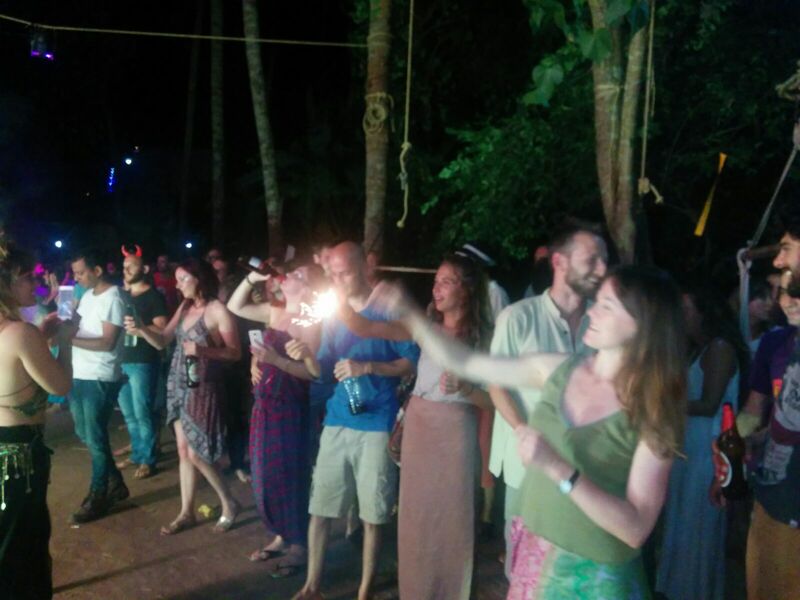 Another highlight is to take the ferry across the channel from Fort Kochi and go to the village of Vypin from where you can take a bus to Cherai beach. This is a very relaxing beach and it is practically empty so you won’t have a lot of Indian men staring while you swim in the ocean. I was so relaxed here that I forgot to be a tourist and take photos. 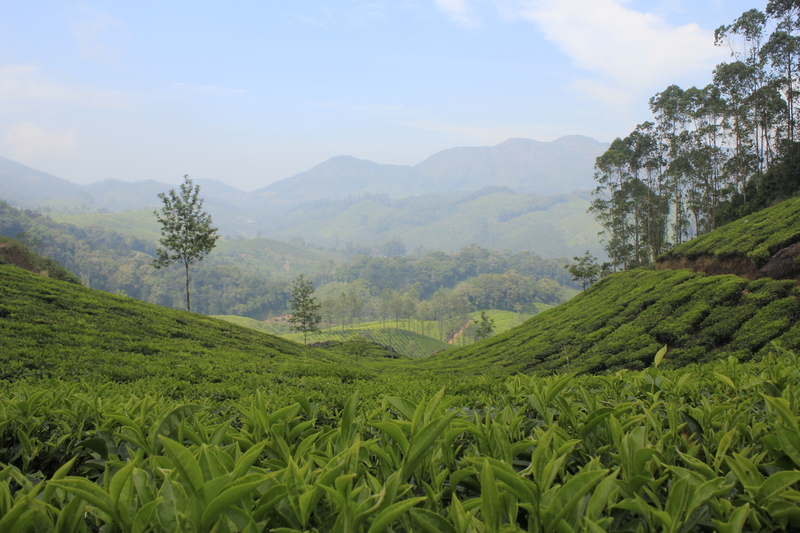 I took a five hour bus to Munnar, a hill station known for its beautiful nature scenery and beautiful tea plantations. 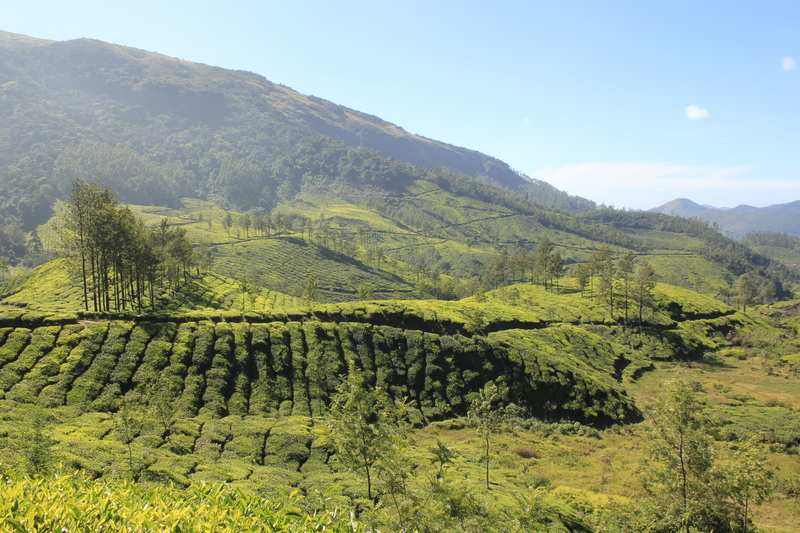 I took a tour with the tourism office to go around the tea plantations, the sandalwood and bamboo forests and to visit the Chinnar wildlife sanctuary. I also joined a guided tour through the plantations organized by JJ Cottages; which was well worth the money spent. 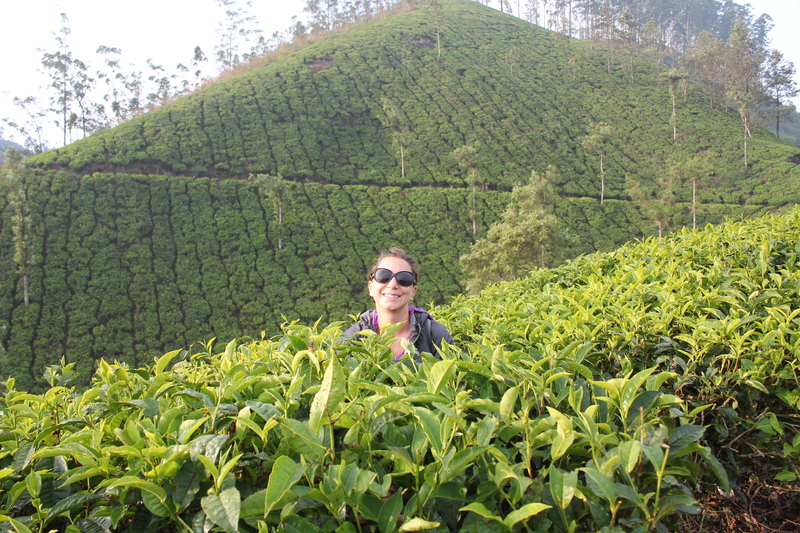 We covered about 14 kilometers going up and down the hills and walking by villages where the tea workers live. This shows the three types of leaves used to make tea. The fine one to make white tea, the one on the left to make green and the large one on the right to make black tea. 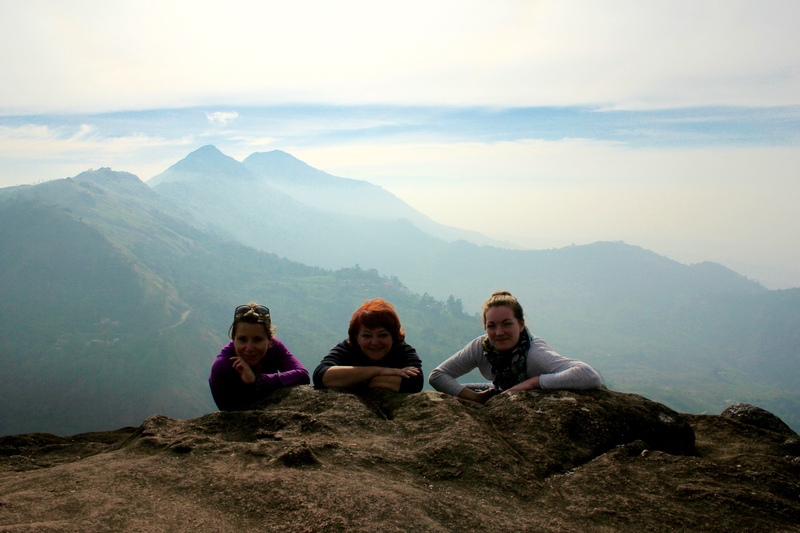 I get up early one morning and with my hiking gear ready, I head over to Eravikulam National Park. As I wait in line to buy my entrance ticket, a recording on the intercom says to be careful not to trek alone because you could encounter wild elephants. They also say that it is best to trek with good jungle boots. I think OK! I am so ready for this adventure! I had to wait in line for one hour to get my ticket and strangely enough I am the only foreigner there, everyone else is from India. After I get my ticket I board a shuttle that takes us to the entrance of the park. Ten minutes later we are dropped off at the beginning of a paved trail that goes up the mountain. I think, great! this is just the beginning and then I will get to some real trails… NOT so! Only 1 kilometer (not even a mile!) later I am stopped by a park ranger telling me that the trek is over. People are only allowed to walk for 1km on the paved road and the rest of the park is off limits. What?!!!! I just paid $5 and waited one hour for this?! GRRR! 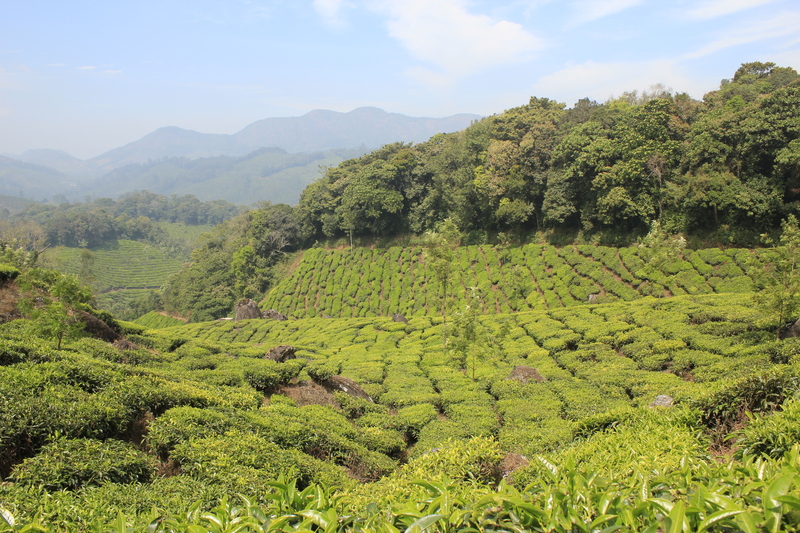 After I calmed down and accepted reality I thought I would walk back down the road instead of taking the shuttle so I could enjoy the breeze and incredible views of the tea plantations. GUESS AGAIN! I was stopped by another park ranger and was told that taking the shuttle was compulsory! WTF?! The good news is that I got to see three Tahr! 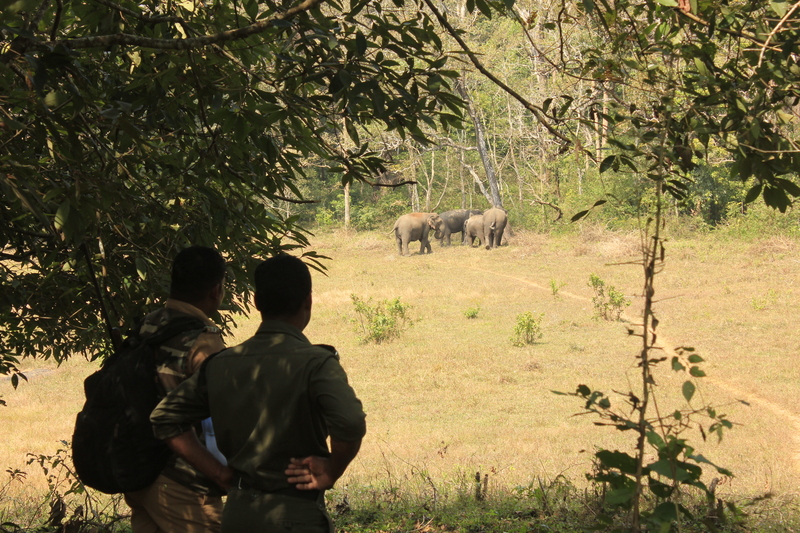 these are supposedly very hard to see and they are one of the most protected species in South India as they used to be well sought out by poachers. 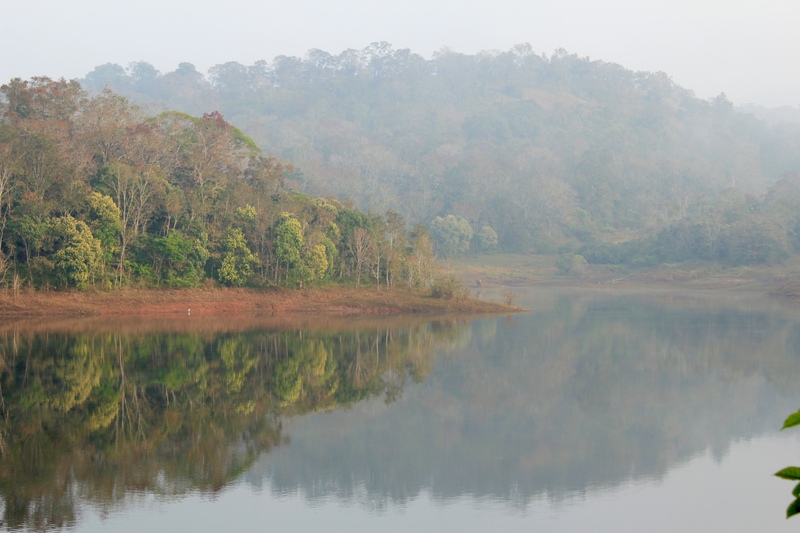 My next stop was one of my favorite in all of India, the town of Thekkady where you find the Periyar Tiger Reserve. 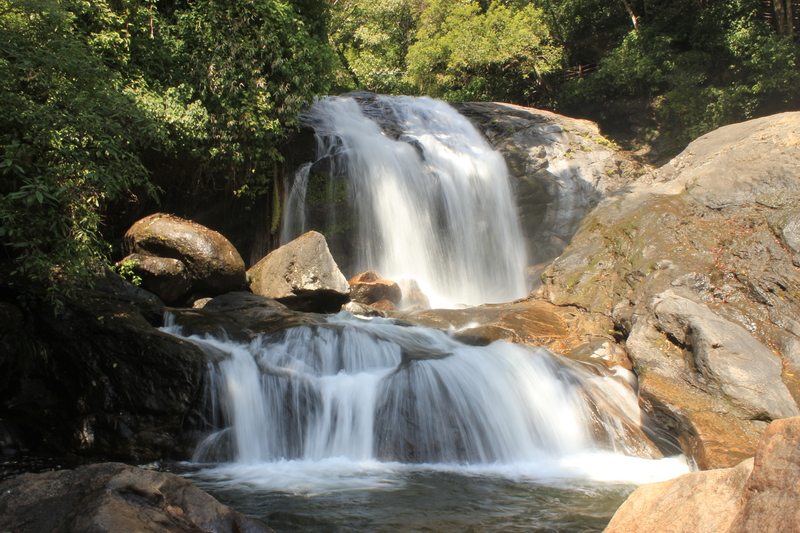 From Munnar I travelled by bus to Thekkady and joined a group on a 3 day/2 night tiger trek in Periyar tiger reserve. 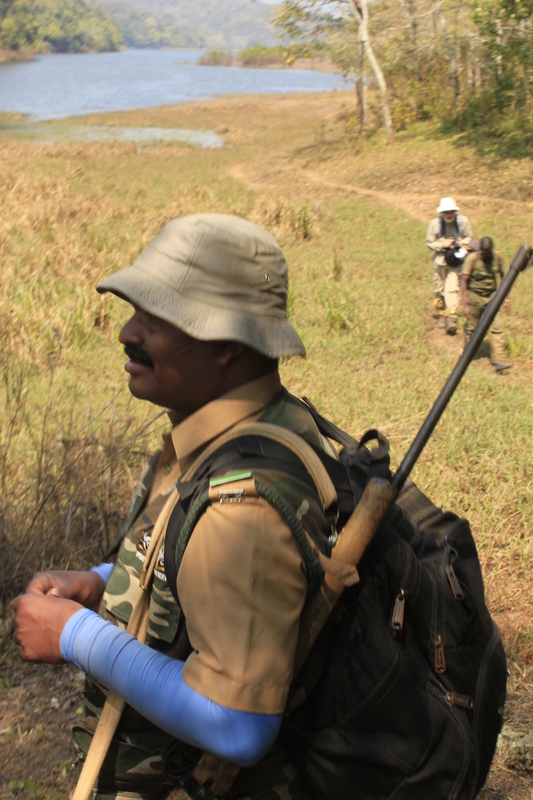 My only mission here was to do whatever possible to see a tiger, even if it meant paying for an expensive guided tour. Unfortunately we did not see a tiger but saw fresh signs of them everywhere. 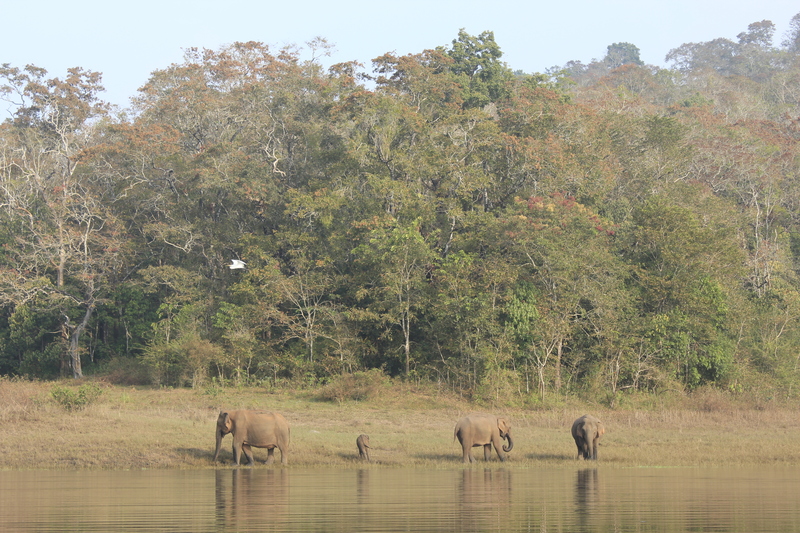 We also had the fortune of seeing bisons, elephants, mongoose, birds, deer, and the red giant squirrels. We did a lot of trekking in the jungle combined with some bamboo rafting to see this family of elephants that was near our camp. The whole trip was incredible and the scenery fantastic. 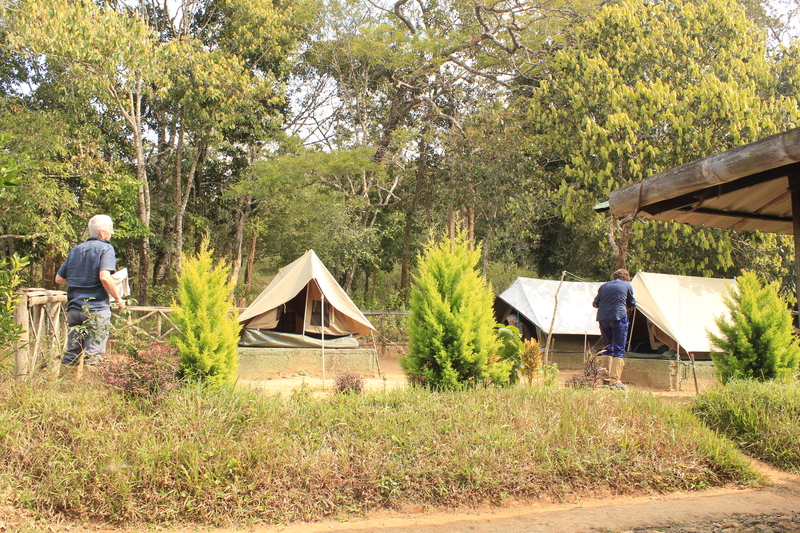 After the trek, I stayed at lord’s nest in town for some more wildlife viewing. I just couldn’t get enough of this beautiful place. views from my room balcony, can you see the group of bisons? 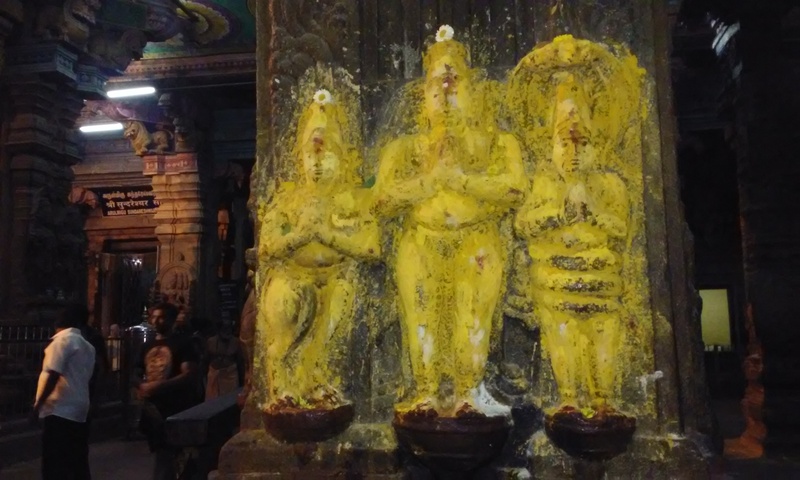 My next stop was Madurai, an important city due to the Meenaskshi Amman temple in the south of India. Madurai was a bit chaotic and dirty but interesting nonetheless. I stayed two blocks from the temple that everyone comes to see; which put me right in the middle of the action. It is all about temple-related commerce around this area, stalls selling flowers and various offerings to use in the temple during the poojas (prayers). You see a lot of devotees in groups, all dressed the same and walking around the streets barefoot, walking towards the temple or going back to their hotel. The temple itself was very impressive; it is a huge complex of towers adorned with the million Hindu deities and inside, huge columns with big statues of deities carved on them, shrines, and the ceiling painted with different symbols. The actual temple inside the complex can only be entered by Hindus. Foreigners are not allowed inside the main shrines of the temples. It was very nice to walk around and observe how all the devotees worshipped the different shrines and prayed together in their groups. 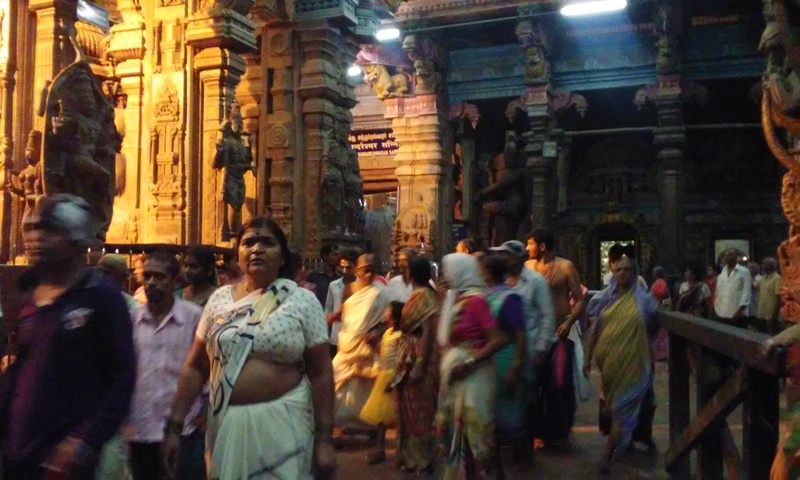 The Meenakshi Amman Temple. This gigantic place is dedicated to Parvati, the consort of the famous lord Shiva. Meenakshi is the name of one of Parvati’s avatars. This place is pretty magnificent with its nine-story gateway towers or Gopurams with thousands of deities carved into each one of them. I read that about 15,000 people visit this place everyday and 25,000 on Fridays, the day of worship. I visited it on Friday night; which was thankfully not too busy but I still got to see a lot of groups of devotees walking around inside the complex and waiting in long lines to enter the inner-temples. Here are some images taken with my phone from inside the temple. Only phone cameras are allowed. the original Charkha used by Ghandi to make homespun cloth. 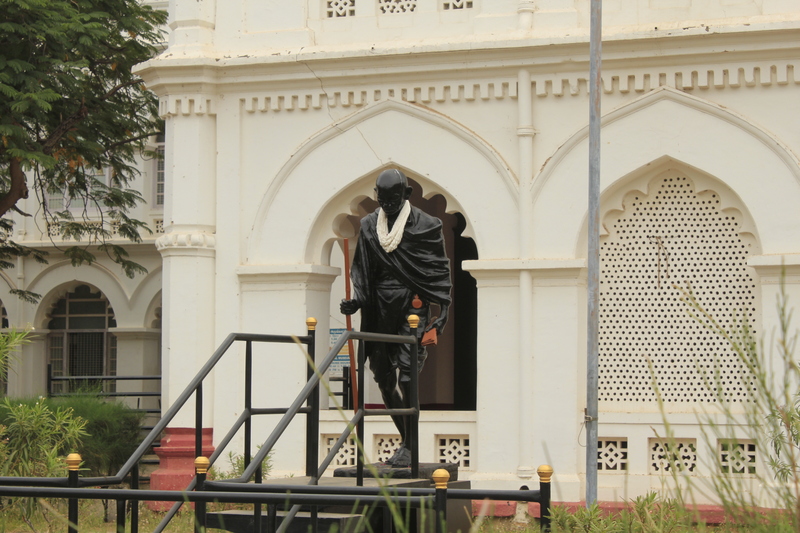 This was an important symbol of the independence from the British and his peaceful fight to liberate India. The charkha is on the middle of the Indian flag. Wow..enjoyed ur post…its so lengthy but very detailed and informative with some beautiful clicks …..hope u had a very good time in southern India..much appreciated …a gr8 review from a foreigner….